The term highbrow was first used in the late 19th century, a reference to the arcane practice of phrenology. In this head measuring methodology, people of intelligence were believed to have a higher brow line. While phrenology was eventually discarded as pseudoscience, “brow-ness” continued as shorthand for measuring artistic and cultural sophistication. That stratification began being actively dismantled 30 years ago (with books by Lawrence Levine, Peter Swirski, John Seabrook, among others) and those distinctions have melted away. Art making, music, theater, writing have all increasingly pulled in resources from every end of the creative spectrum. Two theatrical events in Boston this past week speak to that browlessness. One is a playful and inventive “adaptation” of Twelfth Night performed by London’s Filter Theatre at ArtsEmerson. This muscular and well-honed ensemble takes a Shakespeare favorite and turns its underbelly to the upside. The set looks like a disordered recording studio, and the staging appears casual, disengaged and haphazard. Inspired by Virginia Woolf‘s claim that the play “seems to tremble perpetually on the brink of music,” sound becomes the essential through line. I’ll never see Twelfth Night the same again. 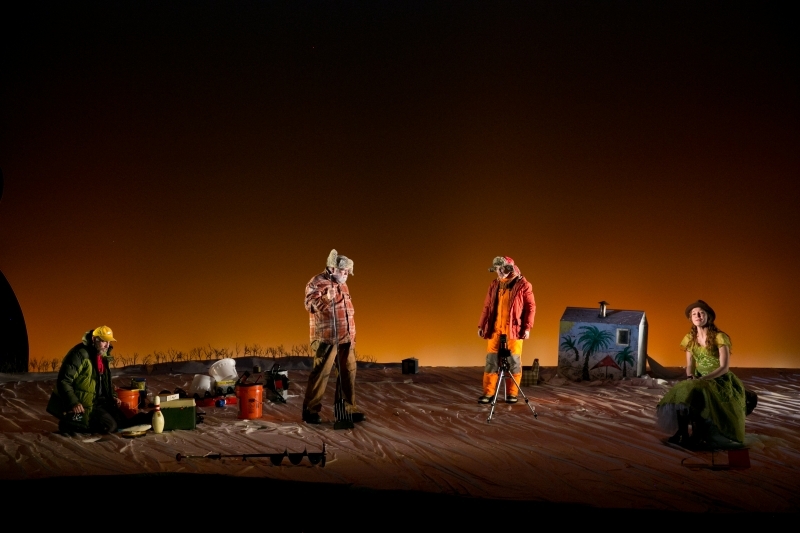 The other is Nice Fish, at American Rep. A collaboration between actor/director Mark Rylance and Minnesota poet Louis Jenkins, Nice Fish has just one stage set: out on the ice. Rylance and co-star Jim Lichtscheidl play two ice fishing friends who, as they tend to their fishing rods, talk about their lives. Their words are primarily prose poems by Jenkins. Buried in the commonplace of Jenkins’ everyday speech are larger questions. But the transcendent sense of things is subtle and mostly stays below the surface, much the way the life teeming under the ice is implied and only occasionally exposed. Nice Fish feels like a blend of a whole bunch of memes most of us recognize—the existentialist stupor of Samuel Beckett‘s Waiting for Godot, the wacky but endearing quirkiness of the Coen Brothers‘ Fargo (both the movie and spin off television series), the simple truths in the everyday of Thorton Wilder‘s Our Town, the Midwestern self-parody of Garrison Keillor‘s A Prairie Home Companion, the All-American réalité of Cowboy Poetry and poetry slams. But Nice Fish is more than an assemblage of contemporary cultural reference points. Having been trimmed down and tightened up after its earlier run at the Guthrie Theater in Minneapolis, the play achieves a memorable balance between the light and the heavy, the silly and the serious, the mundane and the poetic. A tangible air of affection for the material permeates the production. Rylance and Jenkins both have connections to the Midwest—in spite of Rylance’s “veddy English” reputation—and they have become good friends during the process of working on the play (Rylance has famously recited Jenkins prose poems as his acceptance speeches at several award ceremonies). Even Jenkins himself comes on stage to play a role. What’s more, the play is directed by Claire Van Kampen, Rylance’s wife. Nice Fish is unpretentious, made by hand (a high compliment in the art making world) and sticks to the ribs. Rather than the popular brow-busting term nobrow, I prefer thinking of Nice Fish—and other artistic efforts that draw from a wide range of influences—as full brow: something for everyone. slowly, stopping now and then, as if they had no particular place to go. They walk past a streetlamp where some insects are hurling themselves at the light, and then on down the block, fading into the darkness. “The lighting was bad and I was no good at dialogue,” he says. “I would have liked to have been a little taller,” she says. Note to potential theater goers: This isn’t a fast-moving, laugh-a-minute kind of play. One friend saw it when she was jet lagged and had a hard time staying engaged. It is best seen when you are rested and relaxed so the pleasures can be found in this slower paced, pared-down production. Twelfth Night is at the Paramount Theater in Boston until January 30. Nice Fish is at the Loeb Theater in Cambridge through February 7. Deb, love The Afterlife — thanks. And, ‘Nice Fish is unpretentious, made by hand (a high compliment in the art making world) and sticks to the ribs.’ — beauty! Hearing them end the play with The Afterlife was utterly brilliant. Jenkins has a voice all his own. Thanks Sloan!